BAGHDAD, Iraq (CNN) -- Eighty militants were killed and 50 were captured in fighting between Iraqi security forces and militants in Anbar province, the violent area west of Baghdad, the Iraqi Interior Ministry said Thursday. Iraqi police and soldiers, along with tribal leaders, battled al Qaeda in Iraq fighters in the Amriyat al-Falluja village, an Interior Ministry spokesman said. A police official in the area, Ahmed al-Falluji, told Reuters news agency that 70 militants died in the fighting, and said three police officers also were killed. The statement from the Interior Ministry gave no information on casualties to Iraqi security forces or police. The fighting started Wednesday afternoon when dozens of militants attacked the village, about 12 miles (19 kilometers) south of Falluja, where local tribes have taken an anti-al Qaeda stance. Reuters said residents fled the village when the attack began and asked Iraqi security forces for help. Fighting lasted through Wednesday evening. Three foreign fighters were among those captured. American troops were not involved, a U.S. military spokesman in Falluja told Reuters. A major power struggle is under way in the Sunni Arab-dominated province between Sunni tribal leaders and al Qaeda in Iraq militants, according to Reuters. In other action targeting al Qaeda in Iraq, three insurgents were killed and 16 others were detained Thursday in coalition raids, the U.S. military said. The operations took place in Baiji in the northern Salaheddin province, in and around Ramadi in Anbar province, and south of Baghdad. In Falluja, five people died Thursday when a parked car bomb targeted a convoy of guests traveling to a wedding party for an Iraqi police officer, an Interior Ministry spokesman said. Ten people were injured. In Tikrit, north of Baghdad, gunmen shot and killed four Shiite students in a private car leaving Tikrit University, police said. In Baghdad, a roadside bomb exploded Thursday near a minibus filled with City Council officials in the eastern part of the capital, killing one official and wounding four others, an Iraqi Interior Ministry official said. The minibus had no markings to indicate it was carrying government officials. In the northern city of Mosul, a roadside bomb took aim at a police official's convoy and killed one of his guards, Mosul police said. Gen. Wathiq al-Hamadani, Nineveh's police chief, was in the convoy but escaped injury. A U.S. Army helicopter made what the military called a "hard landing" Thursday morning south of the northern city of Kirkuk, injuring two pilots. The cause of the accident is under investigation, but it is believed to be mechanical in nature and not the result of hostile fire, according to the military. The pilots of the OH-58 Kiowa copter were evacuated to a military treatment facility in Kirkuk, about 150 miles (241 kilometers) north of Baghdad. In the past few months U.S. helicopters have crashed or made hard landings eight times. Most have been blamed on hostile fire. The U.S. military disputes a report that 18 boys were killed Tuesday when a bomb detonated near a soccer field in Ramadi. Rear Adm. Mark I. Fox called the report of 18 deaths "erroneous" and repeated military statements that the only explosion that day was administered by coalition troops in a controlled setting. Iraqi Col. Tariq al-Theibani said the incident may have been confused with a Monday blast. He said a parked minibus detonated then in an area children use as a soccer field. Eighteen people were killed, al-Theibani said. More Iraqi police officers were killed and wounded in the line of duty in February, but there was a slight drop in civilian deaths, according to monthly figures from Iraq's Interior Ministry. The ministry said 161 police and soldiers were killed in February. In January, 100 Iraqi police and soldiers were killed. The ministry said 1,646 civilians were killed in February, down from January's figure of 1,990. CNN's Jennifer Deaton and Mohammed Tawfeeq contributed to this report. 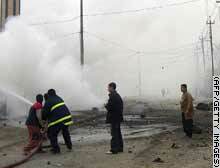 Firefighters spray flames from a car bomb that exploded Thursday outside a wedding reception in Falluja, Iraq.